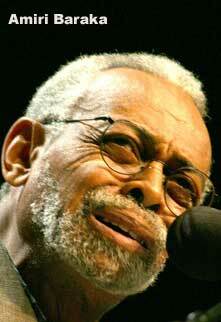 Amiri Baraka loves Barack Obama. Amiri Baraka is a self proclaimed communist. Baraka once led the Revolutionary Communist League (Marxist-Leninist-Maoist). In more recent years he has been a little closer to more orthodox Marxists such as the Communist Party USA and Democratic Socialists of America. His wife, Amina Baraka, has been, in recent years, a member of the Communist Party USA. Amiri and Amina Baraka were both involved in the June 1998 founding conference of the Black Radical Congress in Chicago. Attendees at the conference included future Obama "Green Jobs Czar" Van Jones, member of Standing Together to Organize a Revolutionary Movement and a "9/11 Truther"; future Progressives for Obama founder Bill Fletcher, Jr. (Democratic Socialists of America and Freedom Road Socialist Organization); Obama's then pastor Rev. Jeremiah Wright; and future Obama Black Advisory Council member, Cornel West (Democratic Socialists of America). Rev. Wright and Cornel West spoke at the conference session entitled "Faith as a Weapon: Spirituality and the Role of the Church In The Radical Movement". Baraka has written at least two poems dedicated to his idol - "Ode to Obama" and "Obama Poem". On July 21 2008 Amiri Baraka prepared a statement "Amiri Baraka challenges Black radicals to "do something" about "The Parade of Anti-Obama Rascals", for circulation at the upcoming Black Radical Congress meeting in St. Louis Missouri. Baraka urged his comrades to support Obama, rather than the more openly radical, but completely futile candidacy of former Congresswoman and "9/11 Truther" Cynthia McKinney. Clearly Amiri Baraka knew a lot more about Barack Obama in 2008, than did most of the millions of voters who elected him. In June 2009, Amiri Baraka gave an interview to Russia Today, in which he confirmed his commitment to communism. Baraka praises Obama's "tacit nationalization" of much of the auto industry and also supported Obama's moves towards a "people's democracy" - Marxist code for socialism. Amiri Baraka remains one of America's most committed Marxist-Leninist revolutionaries. He still supports Barack Obama, when some other leftists have deserted the U.S. president. Why? Trevor works so hard to proclaim One Message,Communism is a real and valid threat to freedom everywhere freedom is currently practiced.I hope the warning is being taken serious by many,many,strong and patriotic citizens.I continue to think our own President is a communist. Lawrence Patton McDonald, M.D. (April 1, 1935 – September 1, 1983) was an American politician and a member of the United States House of Representatives, representing the seventh congressional district of Georgia as a Democrat. He was a passenger on board Korean Air Lines Flight 007 shot down by Soviet interceptors and presumed dead. He was a cousin of General George S. Patton. McDonald was the only sitting member of Congress killed by the Soviet Union during the Cold War. A conservative Democrat, he was active in numerous civic organizations and maintained a very conservative voting record in Congress. He was known for his staunch opposition to communism and believed in long standing covert efforts by powerful U.S. groups to bring about a socialist world government. He was the second president of the John Birch Society.